For many companies, fleet sizes are in a constant state of flux. From cars for new starters to complex vans for new contracts, the need to acquire, and often dispose of, vehicles efficiently and at short notice is a key challenge. SHB Hire aims to meet this challenge and its policy is clear: anything is for hire. The family-run business has developed its service level and fleet over the past 40 years and now believes it can meet almost any rental request. Few other rental companies offer such a wide range of vehicles and this approach has seen the company achieve substantial organic growth of 10% year-on-year since 2009 while its turnover has jumped from £52 million in 2011 to £84m last year. The approach isn’t limited to vehicle choice either, SHB will tailor its funding options to suit any business need also. Paul Street, SHB managing director, says: “We go to listen to the customers’ requirements. We can do contract hire, flexible hire, daily rental, buy and rent back, servicing and rent top-up . If the customer and the opportunity arrive then we will flex our solution to suit them. To meet the growing requests SHB now receives, the company has invested in a number of site expansions. Most recently was the opening of its largest depot to date in Gloucester. The five-acre facility follows the format of SHB’s 13 other sites, which have full workshop, body building and MOT facilities. It also recently acquired the Wiltshire-based traffic management equipment supplier Acklea. 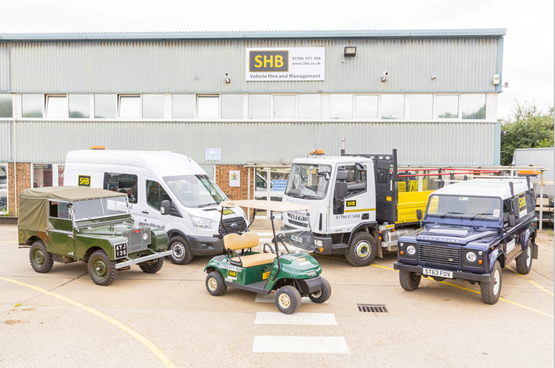 By keeping all vehicle operations in-house, SHB is able to offer a complete proposition to the market which includes on-site – or mobile – servicing and repair of all its rented vehicles and, more crucially, the ability to convert or custom-build any vehicle for any purpose. SHB originated from a plant hire business established in 1968. It has always applied the same mentality for reducing downtime and maintaining efficiency that the construction industry demands. “This diversification allows us to sell a service to a customer rather than just a standalone vehicle. That’s still the approach today, so we try to lock in a customer rather than lock a customer to a vehicle,” says Paul Street. When it comes to cars, the story began with SHB’s first ever vehicle rental – a Land Rover. At the time demand for off-roads was small; however renting 4x4s has always been a core part of the business. SHB has more than 3,000 on the fleet today – including some fully-restored 1960s models. The Discovery sits in one of the company’s most popular hire groups, large 4x4s. They are used by film and TV companies (including the BBC), corporate hospitality providers, project engineers, telecommunication companies and many others who need four-wheel drive for at least part of their journey. Another area where SHB has experienced increased growth is providing pre-contract cars for company car fleets. The company has also seen a noticeable shift in demand from diesel back to petrol, especially on smaller cars with 70% now requesting them. That said, some of SHB’s fleet customers are still running a diesel-only policy, which Paul Street thinks is a costly error. He agrees that diesel is still the best fuel for the higher mileage driver, but points out that a lot of the diesel cars SHB rents are group A models like the Ford Fiesta and are only covering around 10,000 miles per year. Alternative fuel vehicles are also increasing on the SHB fleet. The company started renting hybrid Toyota Prius models in 2009 and alternative fuel now powers 10% of the car fleet, around 100 vehicles. “We are doing more and more electric vehicles, both cars and vans. We supply electric vans to Heathrow Airport, and it has taken electric cars for the last two years as well, plus lots of hybrids,” says Paul Street. “At Heathrow they have them on long term lease (four-five years). They cover low mileages and have lots of charge points, so it’s a good solution. For SHB the most pressing issue with electric cars is who picks up the risk of worn batteries once they are out of warranty. Paul Street explains: “That’s the big thing at the minute. What’s going to happen when these batteries are out of warranty? Who is going to deal with the scrappage? We don’t know all this yet. “Ultimately it comes down to cost. If you are writing the residual value of that vehicle in four years’ time but the warranty is only three, you almost have to write it down to nothing because you just don’t know. SHB’s biggest contracts are still related to the plant hire and construction industry. One of its key clients is Highways England. This contract is a prime example of how SHB has worked to meet the demands of its customer by renting anything it needs on a flexible basis from a panel van to a custom-built traffic management vehicle. “A major problem for contractors is that they are looking for ways to screw down costs and when they win a contract there is no guarantee how much work they will get from it,” says Mike Street. In order to offer such flexibility the company will run vehicle utilisation as low as 60%, which in part is due to the seasonal demands for certain vehicle types such as gritters. For standard panel vans the level is more in-line with the rest of the industry at 80%.